Gallanachmore Farm, Gallanach Road, Oban, Argyll, PA34 4QH. 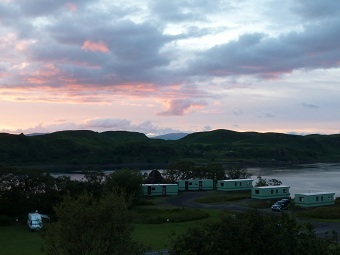 Please check our Late Availability page for Pods and Static Caravan Hire and Special Offers. Why not spend your holiday in all the peace and grandeur of the Scottish West Highlands, yet only a five minute drive from a famous and attractive Argyllshire touring centre? 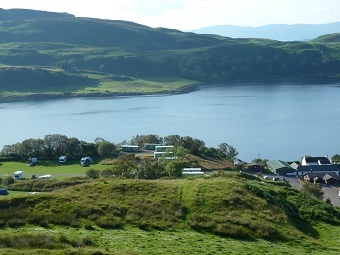 Gallanachmore, where you can stay at a well equipped caravan and camping site, offers the best of both worlds. 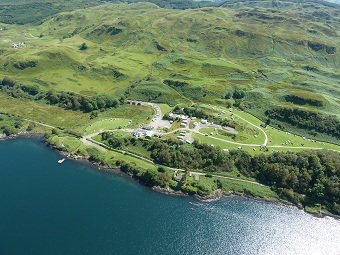 Gallanachmore covers 340 acres set by the sea with magnificent views to the Island of Kerrera. The site offers all the charm and tranquillity of a truly rural setting - guests may feel they are a million miles away from the bustle of modern life, but just three miles down the road is the delightful centre of Oban with its shops, restaurants and many other facilities. 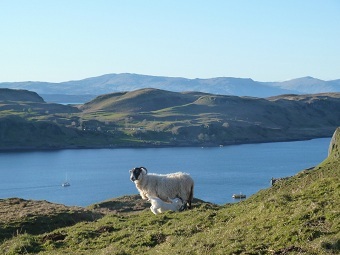 View of Kerrera and Mull from the hill behind the park. Farm Fun - Children are well catered for at Gallanachmore. There are swings on the main camping field, but of greatest interest to the youngsters is usually the duck pond - adults are warned that the ducks and our free range hens may call at your caravan asking for a snack! Dogs - Your dogs (and other pets) are very welcome here at Gallanachmore. Please ensure that your dog is kept on a lead throughout your stay here. 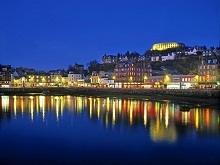 Highland Welcome - Oban itself boasts all the facilities you'd expect from a popular visitor centre. There is an 18 hole golf course, cinema, bars, restaurants and shopping - look out for tweed mill bargains! A summer evening stroll along the fishing pier is a popular pastime for many visitors, or walk along the Esplanade and look at the visiting yachts. Most of all, relax and enjoy the gentle pace of West Highland life and the friendliness of the people. 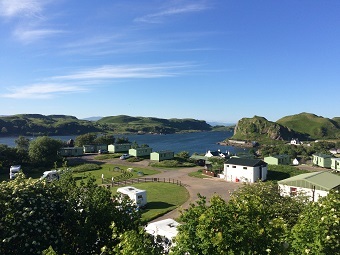 Copyright © 2002 - 2019 Oban Caravan & Camping Park Ltd.